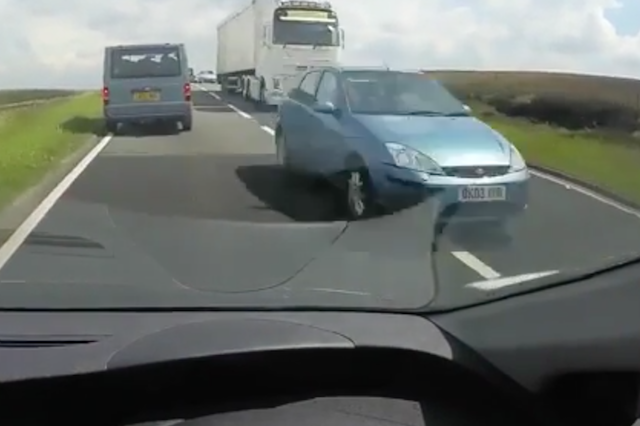 This is the terrifying moment a family were nearly victims of a head on collision. Peter Hampson was driving with his family in south Yorkshire when a blue Ford Focus suddenly overtook them in a crazy manoeuvre between the car in front and an articulated lorry traveling in the opposite direction. The footage was captured on Hampson's dashcam and shows him driving along a scenic country road when he is forced to swerve sharply to the left, avoiding a nasty collision. He spoke to the Daily Mail following the incident, saying: "As you can see in the clip, this reckless driver decided it'd be a good idea to try and squeeze through a tiny gap at a high speed. "Thankfully I caught things on my dash cam and handed the footage straight to the South Yorkshire Police."